9Coordenadoria de Pesquisa, Instituto Nacional do Câncer, INCa, Rio de Janeiro Brazil. Received 29 May 2011; revised 20 July 2011; accepted 8 September 2011.
manage the patients with CF. age and eventual death from respir atory failure . bile ducts, airways, intestinal and deferent vessels . activities common to their age group . against lung infections and other challenges . and it is an independent pred ictor of survival [12-15]. besides the footwear cond itions. patients with C F have been reported [30,31]. cost physiologic strategy to treat CF would be welcome. and e) “cystic fibrosis” and physical activ ity. are shows in Table 1 an d it is almost the same. the studies related to the pancreas, heart and liver. “cystic fibrosis” and steps of the human development. nage patients with cystic fibrosis. ing “cystic fibrosis” and mucoviscidosis. ing “cystic fibrosis” and some organs. ing “cystic fibrosis” and the gender. ing “cystic fibrosis” and possible modalities of treatments. Table 7. Information about the conditions of protocols used in the treated and control groups and the clinical findings. of the two-leg jump significantly improved. with FEV1 or FVC in this study. 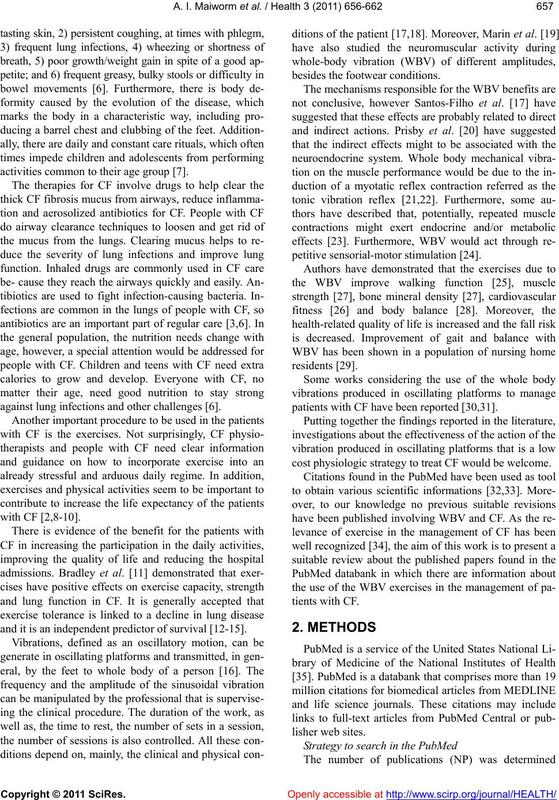 improve muscle function in CF patients. motion of the thorax, s p i n e a n d e x t r emities. in the majority of the study participants. force in the one-leg jump. alone or together (Table 1). for a person with CF is more than 37 years [2,3,6]. cations in CF in male and female (Table 3). non-classic phenotypes typically diagnosed as adults. of studies with CF and pre g nancy (Table 4). volving CF and nutrition (Table 5). 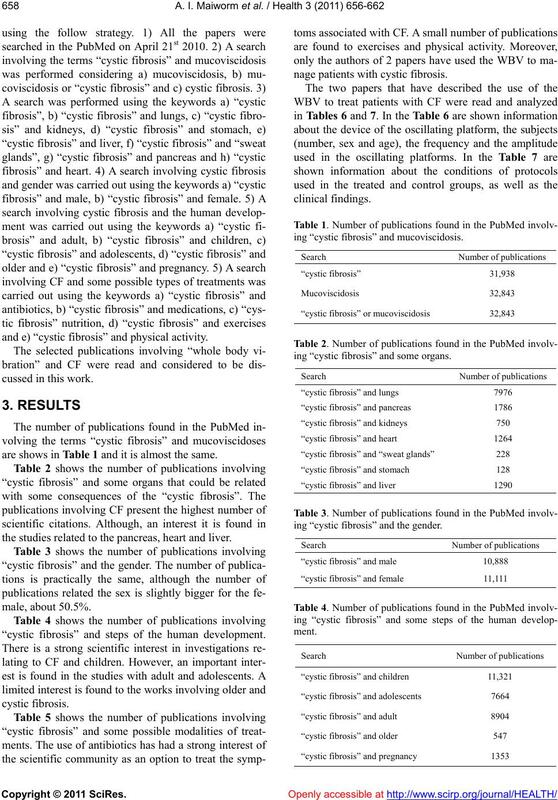 PubMed data b a nk (Table 5). suitable to manage patients with CF. Ribeiro, D.J., de Ribeiro, M.A.G.O. and Ribeiro, A.F. Cystic Fibrosis Foundation. (2010). http://www.cff.org. Selvadurai, H.C., Blimkie, C.J., Cooper, P. J., Mellis, C.M. Disease in Childhood, 89, 928-933.
domised controlled study. Chest, 125, 1299-1305.
mission of whole vibration in children while standing. Clinical Biomechan ic s , 25, 181-186.
tific interest? FIEP Bulletin, 80, 875-878. Journal of Sports Medicine, 39, 585- 58 9. Marín, P.J., Bunker, D., Rhea, M.R. and Ayllon, F.N. Prisby, R.D., Lafage-Proust, M., Malaval, L., Belli. A.
ing Research Reviews, 7, 319-329.
national Journal of Sports Medicine, 23, 374-379. Ebersbach, G., Edler, D., Kaufhold, O. and Wissel, J.
randomised controlled trial). Age Ageing, 38, 448-454.
trolled trial. BMC Musculoskelet Disord, 7, 92. 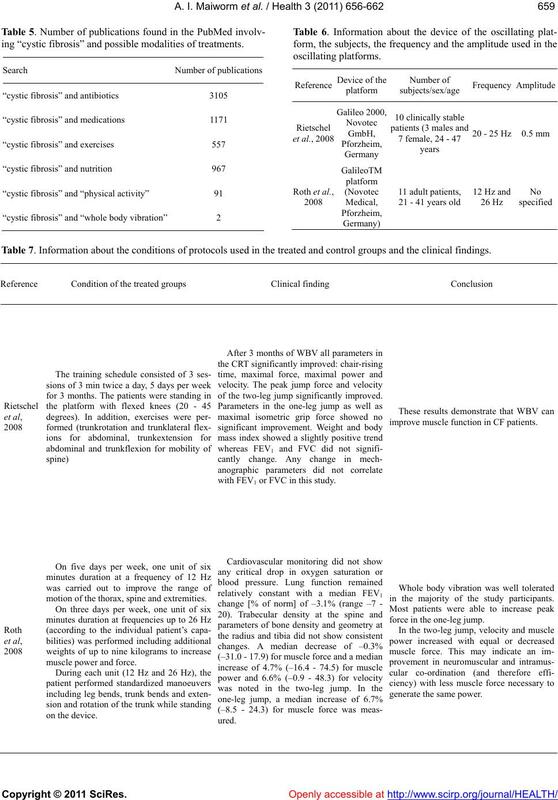 Keio Journal of Medicine, 56, 28-33.
of Physical Medicine and Rehabilitation, 86, 303-307. American Journal of the Medical Sciences, 4, 59-62. Winchester, D.E., Wymer, D.C., Shifrin, R.Y., Kraft, S.M. chest pain. Mayo Clinic Proceedings, 85, 358-364.
breathing patient. Thorax, 64, 1-51. Ramsey, B. (1997) Gender gap in cystic fibrosis mortality. American Journal of Epidemiology, 145, 794-803. Dodge, J.A., Lewis, P.A., Stanton, M. and Wilsher, J. 1947-2003. 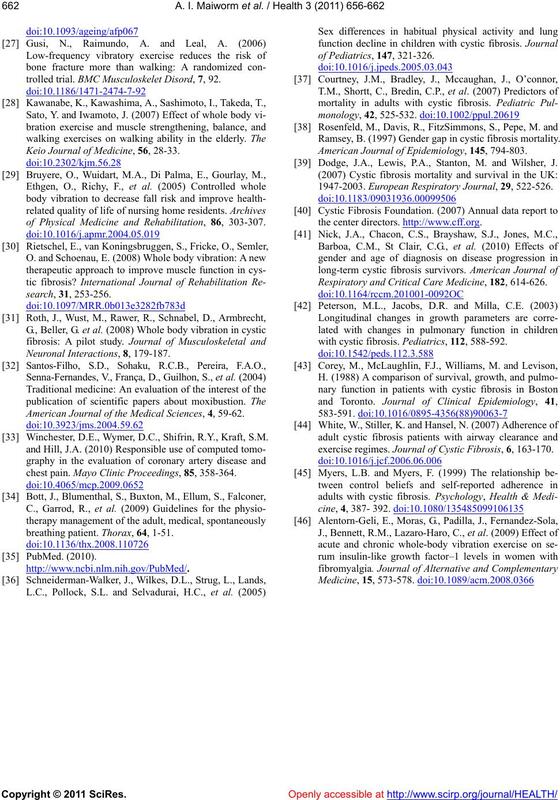 European Respiratory Journal, 29, 522-526. Respiratory and Critical Care Medicine, 182, 614-626.
with cystic fibrosis. 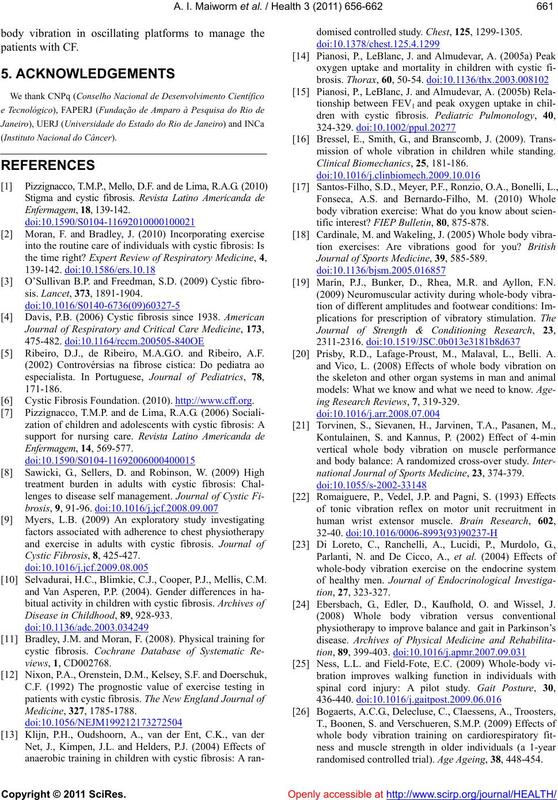 Pediatrics, 112, 588-592.
exercise regimes. 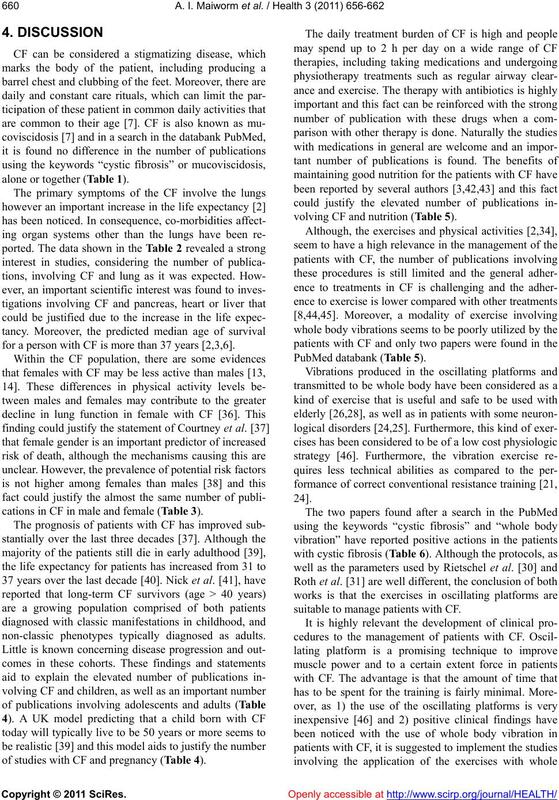 Journal of Cystic Fibrosis, 6, 163-170.